Astronomers have used ESO's Very Large Telescope to measure the distribution and motions of thousands of galaxies in the distant Universe. This opens fascinating perspectives to better understand what drives the acceleration of the cosmic expansion and sheds new light on the mysterious dark energy that is thought to permeate the Universe. "Explaining why the expansion of the Universe is currently accelerating is certainly the most fascinating question in modern cosmology," says Luigi Guzzo, lead author of a paper in this week's issue of Nature, in which the new results are presented. "We have been able to show that large surveys that measure the positions and velocities of distant galaxies provide us with a new powerful way to solve this mystery." Ten years ago, astronomers made the stunning discovery that the Universe is expanding at a faster pace today than it did in the past. "This implies that one of two very different possibilities must hold true," explains Enzo Branchini, member of the team. "Either the Universe is filled with a mysterious dark energy which produces a repulsive force that fights the gravitational brake from all the matter present in the Universe, or, our current theory of gravitation is not correct and needs to be modified, for example by adding extra dimensions to space." Current observations of the expansion rate of the Universe cannot distinguish between these two options, but the international team of 51 scientists from 24 institutions found a way that could help in tackling this problem. 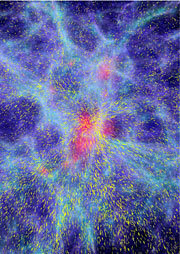 The technique is based on a well-known phenomenon, namely the fact that the apparent motion of distant galaxies results from two effects: the global expansion of the Universe that pushes the galaxies away from each other and the gravitational attraction of matter present in the galaxies' neighbourhood that pulls them together, creating the cosmic web of large-scale structures. "By measuring the apparent velocities of large samples of galaxies over the last thirty years, astronomers have been able to reconstruct a three-dimensional map of the distribution of galaxies over large volumes of the Universe. This map revealed large-scale structures such as clusters of galaxies and filamentary superclusters," says Olivier Le Fèvre, member of the team. "But the measured velocities also contain information about the local motions of galaxies; these introduce small but significant distortions in the reconstructed maps of the Universe. We have shown that measuring this distortion at different epochs of the Universe's history is a way to test the nature of dark energy." Guzzo and his collaborators have been able to measure this effect by using the VIMOS spectrograph on Melipal, one of the four 8.2-m telescopes that is part of ESO's VLT. 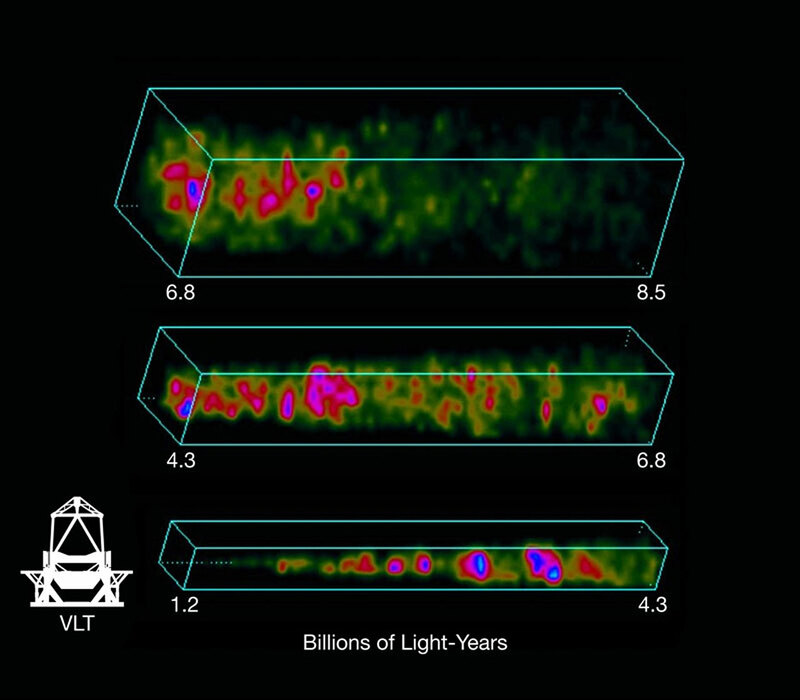 As part of the VIMOS-VLT Deep Survey (VVDS), of which Le Fèvre is the Principal Investigator, spectra of several thousands of galaxies in a 4-square-degree field (or 20 times the size of the full Moon) at epochs corresponding to about half the current age of the Universe (about 7 billion years ago) were obtained and analysed. "This is the largest field ever covered homogeneously by means of spectroscopy to this depth," declares Le Fèvre. "We have now collected more than 13,000 spectra in this field and the total volume sampled by the survey is more than 25 million cubic light-years." The astronomers compared their result with that of the 2dFGRS survey that probed the local Universe, i.e. measures the distortion at the present time. Within current uncertainties, the measurement of this effect provides an independent indication of the need for an unknown extra energy ingredient in the 'cosmic soup', supporting the simplest form of dark energy, the so-called cosmological constant, introduced originally by Albert Einstein. The large uncertainties do not yet exclude the other scenarios, though. "We have also shown that by extending our measurements over volumes about ten times larger than the VVDS, this technique should be able to tell us whether cosmic acceleration originates from a dark energy component of exotic origin or requires a modification of the laws of gravity," explains Guzzo. "VIMOS on the VLT would certainly be a wonderful tool to perform this future survey and help us answer this fundamental question. This strongly encourages scientists to proceed with even more ambitious surveys of the distant Universe," concludes Le Fèvre. 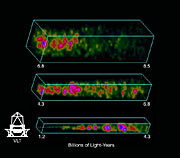 The VLT VIsible Multi-Object Spectrograph (VIMOS) can observe spectra of about 1,000 galaxies in one single exposure. This cosmology science machine is installed at the 8.2-m MELIPAL telescope, the third unit telescope of the Very Large Telescope (VLT) at the ESO Paranal Observatory. The team is composed of L. Guzzo, A. Iovino, and O. Cucciati (INAF-Osservatorio Astronomico di Brera, Merate, Italy), M. Pierleoni, J. Blaizot, G.De Lucia, and K. Dolag (Max Planck Institut für Astrophysik, Germany), B. Meneux, B. Garilli, D. Bottini, D. Maccagni, M. Scodeggio, P. Franzetti, P. Memeo, and D. Vergani (INAF-IASF, Milano, Italy), E. Branchini (Universita Roma III, Italy), O. Le Fèvre, V. LeBrun, L. Tresse, C. Adami, S. Arnouts, A. Mazure, and S. de la Torre (Laboratoire d'Astrophysique de Marseille, OAMP-CNRS - Université de Provence, France), A. Pollo (Laboratoire d'Astrophysique de Marseille, OAMP-CNRS - Université de Provence, France and Andrzej Soltan (Institute for Nuclear Research, Warsaw, Poland), C. Marinoni (Centre de Physique Théorique, CNRS-Université de Provence, Marseille, France), S. Charlot (Institut d'Astrophysique de Paris, CNRS-Université de Paris 6, France), H. J. McCracken (Institut d'Astrophysique de Paris, CNRS-Université de Paris 6, and Laboratoire d'étude du rayonnement et de la matière en astrophysique, CNRS - Observatoire de Paris, France), J. P. Picat, T. Contini, R. Pellò, and E. Perez-Montero (Laboratoire d'Astrophysique de Toulouse et Tarbes, OMP-CNRS-Université de Toulouse 3, France), G. Vettolani and A. Zanichelli (INAF-IRA, Bologna, Italy), R. Scaramella (INAF- Osservatorio Astronomico di Roma, Italy), S. Bardelli, M. Bolzonella, A. Cappi, P. Ciliegi, F. Lamareille, R. Merighi, G. Zamorani, E. Zucca, and L. Pozzetti (INAF-Osservatorio Astronomico di Bologna, Italy), A. Bongiorno and B. Marano (Universitá di Bologna, Italy), L. Moscardini (Universitá di Bologna and INFN-Sezione di Bologna, Italy), S. Foucaud (University of Nottingham, UK), I. Gavignaud (Astrophysikalisches Institut Potsdam, Germany), O. Ilbert (University of Hawaii, USA), S. Paltani (Geneva Observatory and Integral Science Data Centre, Versoix, Switzerland), and M. Radovich (INAF-Osservatorio Astronomico di Capodimonte, Napoli, Italy). L. Guzzo is also associated with the MPE, MPA and ESO. "A test of the nature of cosmic acceleration using galaxy redshift distortions", by L. Guzzo et al., Nature, 31 January 2008.